In our quick, overview look at God's Plan for the Ages, we are looking at the four major prophesied triumphal events on the horizon that we as born again children of God can look forward to. In our last segment we addressed the Second Coming and the Millennium. We will now look at the fourth event — Heaven. The final stage of God's Plan for the Ages will come at the end of the Millennium, when we will be presented with our Heavenly home. The Redeemed will be removed from this planet to the New Jerusalem which Jesus has been preparing for us. And I suspect that from that vantage point, we will be able to watch the greatest fireworks display in history as God superheats this earth to burn away the pollution of Satan's last revolt. That's right, Heaven will be on a new earth. We will be lowered down inside the New Jerusalem to the new earth, and God Himself will come to earth to live among us. 4) and He will wipe away every tear from their eyes; and there will no longer be any death; there will no longer be any mourning, or crying, or pain; the first things have passed away." 5) And He who sits on the throne said, "Behold, I am making all things new." And He said, "Write, for these words are faithful and true." 6) Then He said to me, "It is done. I am the Alpha and the Omega, the beginning and the end. I will give to the one who thirsts from the spring of the water of life without cost. 7) "He who overcomes will inherit these things, and I will be his God and he will be My son." According to Revelation 22:4, we will "see God's face" — which means we will have intimate fellowship with our Creator eternally. And Revelation 22:3 says we will "serve Him forever." Yes, we are going to have meaningful and fulfilling things to do in service to our Creator. 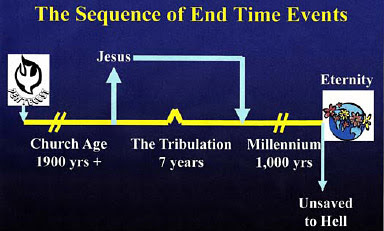 In summary, let's look at an overview of God's Plan for the Ages as illustrated in Figure 2. First, Romans 8:18: "I consider that the sufferings of this present time are not worthy to be compared with the glory that is to be revealed to us." He repeats this sentiment in 1 Corinthians 2:9-10 where he writes: "No eye has seen, no ear has heard, nor has the mind of Man conceived what God has prepared for those who love Him." But in the next verse, he adds that these glorious things have been revealed to us through His Spirit — speaking, of course of His Word. In like manner, the Apostle Peter referred to the events we have surveyed as "God's precious and magnificent promises" (2 Peter 1:4). When you consider the details of God's Glorious Plan for the Ages, how can you possibly be passive or apathetic? Glad to be a blessing, Susie! Continuing our conversation on the Two Witnesses' identity from under Proclaiming an Urgent Message. It's been Church tradition from the Early Church Fathers that they would be Enoch and Elijah based on Malachi 4:5. Again, though, they were speculating as we are today. Nobody has come back from the dead to lead the living but Jesus Christ Himself. A.F. maintains the Two Witnesses are ‘two future persons – not ‘men from the past’; Jewish Prophets whom God will raise up during the Tribulation itself and will endow with miraculous powers. I have wondered if these men are two of the 144,000 - they are also supernaturally protected from harm? The 144,000 Jewish evangelists will have a seperate and distinct mission from that of the Two Witnesses. They will be messengers of the Gospel of the Kingdom signifying the redemptive work of Christ. The Two Witnesses will also testify of Christ yet to warn ungodly rulers that their time is short, for the King is soon to return and establish his kingdom forever. These two prophets will use a series of judgements to convince the ungodly of their need for repentance and that only by the blood of the Lamb of God will we find justification in the sight of God. It’s nothing I would want to argue over as I agree about the 144,000! I just wondered if they would be part of that witness group. Also Elijah is to come BEFORE the Trib to help turn the hearts of Israel; that’s another reason why he can’t be one of the two Witnesses imo; because he has a separate ministry to them! Food for thought from Dr.John Witcomb re. the two Olive Trees in Zech and Rev 11: suggests they are to be 'priests' much like Joshua the High Priest and Zerubabbel governor of the Jewish remnant ‘who returned from Babylon to re-establish legitimate worship in Jerusalem’. They don’t have to wait until the re-building of the 3rd Temple as in Ezra3:2-,3. I can agree that could be the case, as the way I understand it, it is the ‘Holy Place’ that is desecrated, there is no need for the rest of the Temple to be built at the start. The FIRST operation before Temple building could begin was the ashes of the Red Heifer to ‘purify’ the waters – to purify the site to begin the sacrifices – in preparation for the Temple to be built. See book ‘The Temple’ by Alfred Aldersheim. Link to Pre-Trib Research and Whitcomb. E.I., I personally believe the Third Temple will be built in honor of the great deliverance of Israel over the Gog/Magog alliance. I do not agree with several sholars that suggest this Holy Temple will reside in the midst of the profane structures known as the Dome of the Rock and Al Aqsa Mosque. Daniel the Prophet and Christ identify this Temple as a Temple of God, it is also clear that the cleansing of the land in the aftermath of the Gog/Magog battle is in preparation for the construction of the Temple. The process involved in construction of a dwelling place for the Lord to dwell in the midst of the people was to cleanse the land of dead bodies and remove all idols and destroy temples or high places of worship reserved for pagan deity, for the Lord our God is a jealous God. The Priests and the people must also purify themselves as they minister before the Lord. What honor will the Lord God have if Islamic profane structures remain on the Temple Mount? Obviously, such a suggestion is far removed from the reality of the purpose and plan of God for his people Israel and the nations of the world. The deliverance of Israel by the mighty hand of the Lord God in the Gog/Magog battle is not for the sake of Israel as recorded, it is for the sake of the Holy Name of God. It is about his glory and the Lord God will not allow this glory to be given to another. When the Temple is visible on Mount Moriah it will be a testimony to all the nations that the Holy One in Israel has returned and is in the midst of his people. Though it is also suggested that the AntiChrist will allow the Temple to be built, it is clear that this is an error. The AntiChrist does not enter the Holy Land until the mid-point of the Tribulation. The covenant he confirms with many has very little to do with Israel at the beginning of the Tribulation. I believe it can be identified as a global disarmament treaty. The Two Olive Trees are also depictions of the two annointed offices, Prophet and Priest! In many cases the candidate for King of Israel was selected by the Lord God and commissioned by the laying on of hands by the Prophet and the High Priest! The impartation that took place would ensure that the King would also operate in these offices as well, to lead the people according to the Way of the Lord. E.I., regarding the passage you provided in the Book of Ezra, if you continue to chapter 5, you will find that Joshua and Zerubbabel represented as Priests were accompanied by two Prophets in the construction of the Temple. The Prophets Haggai and Zechariah were present and aided in the construction as Ezra 5:1,2 records. I am trying desperately to be sensible and study; but the 'Gog Magog' war is going on ALL AROUND me as I write. It started two hours ago and as time passes the 'kiddy' war is going to the big stuff! I have been repeatedly bombed, suffered flash grenades, HUGE explosions, rapid fire from every which way direction. NOW someone has cranked up the volume on a party. GONE are the days of pretty Sparklers and soft Golden Fountains it is seriously STARTLING! I haven't gone loopy, its Remember, remember the 5th of November, gunpowder, treason and plot! Bonfire Night when an effigy of the Roman Catholic traitor, Guy Fawkes is burned in fires all over the land. If this is 'fun' I am glad I shan't be around when the world erupts and the explosions are for real. I feel rather sorry for the Roman Catholic population. Not their HQ mind, but the peeps caught up in it. See ya later when the mayhem subsides - it may take a while! The devil is in the details no doubt especially when a serious discussion is taking place! We must remain focused, if not, it is best to wait and respond when we can be focused. I tell ya, I swear soldiers have got hold of some Bunker Busters, they be EARTH SHATTERING! Its gone 11 o’clock and legally they should stop now – but there are always some rebels – but it is much quieter now. Ooo spoke too soon – that was a big un…! Personally, I have never heard anyone I read claim the Temple will be built IN the Dome of the Rock and the Al Aqsa. I would think that too big an area from what I saw??? Some do claim they could be in the court of the Gentiles with the Temple built further North. From memory, the huge earthquake that will destroy a large ammount of Jerusalem at the 6th Trumpet Rev.11; Zec14 which causes an west/east split through the mount of Olives – through the Kidron, and into the Mount, for the Jerusalem Jews to escape (Rev12) would destroy anything built including any Temple buildings. Also, don’t forget the Mount will be raised a lot higher than today, the entire topography will be massively altered (Isaiah2; Zech14; Micah4, Rev6 I think ? ) Jerusalem will become a Port, so that will be VERY different. Ages ago a group I know claimed the Kidron is actually HELL itself with the fires burning the baddies in sight of the saints, but as I said at the time, it’s an idea that will never work as the whole of that area will be under water! Its no good, I’ve got shell shock and I can barely remember my name right now; but I don’t think your idea can work from memory. Beastly facts have an irritating way of always spoiling a good theory! Though there is presently much speculation regarding a proposed Israeli strike on Iran, it is my opinion that it will not come to fruition. Though the political fervor in Israel is at a fevered pitch, the most seasoned and veteran military staff of the IDF and intelligence branches do not agree with Prime Minister Netanyahu and Defense Minister Ehud Barak. Without joint cooperation of U.S. and N.A.T.O. in such an operation it will clearly not materialize, the risk of sparking a regional conflict in an already reeling middle east would be devastating to the security also of N.A.T.O. and U.S. personnel in the region. I can file this one in the "Rumors of War" category!! E.I. I do not believe I proposed any theory, just the facts concerning the Temple! The Third Temple will stand alone on Mount Moriah, the Dome of the Rock and Al Aqsa Mosque will no longer occupy the threshing floor purchased by David the King of Israel. The significance of witnesses by the appearance of Elijah and Moses at the Transfiguration of Jesus Christ is found in almost all commentaries on the passages. What you 'probably' forgot to mention is that after the voice of the Father, when the Apostles finally looked up again, Moses and Elijah, the glory of the "Law and the Prophets" had disappeared, giving way to the preeminence of Jesus Christ standing alone. As to the fact that "they appeared in glory", God would never present His saints naked and uncovered, and any form of "Heavenly" covering [ie. a temporary heavenly body...] that He would visibly provide to human witnesses, by definition, would be glorious, but that is not the same as claiming either one now has a "glorified body", especially prior to Jesus receiving His. That said, however, I have to agree that Enoch will not be one of the witnesses in that Hebrews flatly states "...that he should not see death...", but this is nowhere said of Elijah, so therefore he is still a valid contender! EI said "...Enoch is clearly said to have been TRANSLATED..."
Only in a few translations, the rest [NIV, BBE, CJB, ESV, HCSB, NAS, NKJV] only have "taken, removed, or transferred", which is closer to the meaning of 'metathesis' [lit. the "after-placing"], and is used that way in other passages... so I would still have to disagree that he has received a "glorified body", prior to the resurrection, as previously stated. Even great scholars can have hard-to-shake preconceived notions and give metathesis a 'metaphysical' interpretation by substituting "Translated" for "removed". I haven't fully researched it yet, but if anyone can show that it is used more frequently as 'translating', as in from one language to another [different] one, that would possibly give credence to translating his body from one 'form' to another, rather than the common meaning of transferring from one place to another. As always, you have a patchwork of ideas that I can agree with, but its the way you put things together that I can't go along with. I mean, the context of Daniel 9:27, and the strengthening of the 7 year contract is made with ISRAEL; the many, meaning the majority of Israel - perhaps by referendum? The A/c has a great deal to do with Israel as his revealing is when the contract is confirmed with them starting the Trib. I find it really wearing trying to follow your lines of reasoning. It's like going through an un-necessarily convoluted Labyrinth with loads of dead ends and false starts. You seem determined to invent unique scenario's in an attempt to be 'different' by complicating the obvious! So I'm afraid that's me done on the subject; I really do try with you, but I feel like I am conversing with the White Rabbit and me name aint Alice! E.I., there is no real evidence that this confirmation of a covenant or agreement includes Israel. Obviously the AntiChrist comes to power during a time of cataclysmic war and economic devastation. I further believe he will arrive on the scene at the heels of the Gog/Magog battle of Ezekiel 38-39. If then the AntiChrist, arrives on the world scene at that point, why would Israel, need any third party, to guarantee security measures for the Jewish State of Israel in a proposed peace plan. Israel will be in a position of power, having spent the previous months burying a host of enemies. The entire world will have acknowledged the mighty hand of the Lord God. Imagine for a moment, someone approaching Moses and the children of Israel after witnessing the might of Egypt covered by the sea and saying,"Moses, you know, I can provide you certain security guarantees if you agree to have peace with Egypt"! The theory that this confirmation of a covenant with many, includes Israel, is based on mere speculation in my opinion, in fact it makes me chuckle. DrNoFog, I can only say that I must continue to agree to disagree regarding the possibility of even Moses and Elijah being the Two Witnesses of Revelation 11. Just heard on FOX News...they were discussing the Oklahoma earthquake and the reporter said the EXPERTS could not explain the increase in earthquakes in certain regions. They ended up blaming natural gas "fracking" or whatever it is called. Read Daniel 9 from vs ONE to see the context and the SUBJECT of Daniels prayer. The entire context is ISRAEL. If your President makes a speech for re-election in the USA; then the people and events he refers to is the U.S.A. and citizens. Finally he says ‘I will do this that and the other if I get the majority vote (the many). The Grammar and context makes it clear that ‘the many’ who will vote for him, are still American Citizens and has nothing to do with other people in other countries. It is established by the syntax that ‘the many’ is still about ISRAEL. It reports ‘sacrifices, oblations, grain offerings’ ALL stress ISRAEL, and their worship practices. All the rules of Grammar give no leeway to suddenly suppose ‘the many’ are no longer Israel, but ‘others’, which is reading into the text what isn’t there! I know it is popular, one way or the other, to think of Israel being in a place of strength after burying Gog’s army – but that is not what I see when I read these verses. To my mind, the ‘covenant’ is one that is already in existence, as ‘it’ is being strengthened. I suspect this could be the Eternal Land Covenant God made with Israel and the A/c who is the Prince of Rome okays it for 7 Years? The majority vote of decimated Israel will still be faithless (the many) even after seeing the miracle of their rescue by God, as in exit Egypt; as they STILL didn’t trust God to deliver. Perhaps they will sign up with this earthly king because they have to, as Rome (E.U.) is pulling the strings of the world perhaps having dislodged the present U.N.? By this time a minority of Jews in Israel have already recognised the truth of Jesus being their Messiah, hence the reason for saying ‘the many’ because not all will want anything to do with this Roman Prince that they recognise as the A/c. Elijah will have already begun to turn the hearts…Malachi 4:5,6; and that’s why there is a slaughter of all new believers from the very start of the 7 years. If not by A/c then by the F/p of the Harlot church. Plus the 144,000 Gospel Witnesses are selected and sealed at the very start of the first 1260 days (3 ½ yrs) ISRAEL, Jews and Jerusalem are Satan’s prime target! I don’t pretend I have all the answers Rodney; but I can still see when ideas don’t fit the context of Scripture. ...he's been quite reliable in following & documenting 'unusual' weather patterns, volcanic, and earthquake activity, and has indeed found a connection to fracking in some areas. E.I., perhaps it would help to consult the Hebrew Tenach regarding the interpretation of Daniel 9:27. "He will forge (give strength to) a covenant (alliance) with great ones (Hebrew: rabim-many, strong ones) for one week.." The question we must ask, who are these strong ones mentioned here? I personally believe this is a reference to the 10 Kings of Daniel 7:24. It is clear that the world will have witnessed the mighty deliverance of Israel by the Lord in the Gog/Magog battle of Ezekiel 38-39, thus I believe the motive of the AntiChrist here is to secure and even greater alliance to come against Israel. It appears this is a strategic alliance, I believe this has very little to do with peace. Once the alliance is secure during the first half of the Tribulation, then will the AntiChrist grow impatient and begin his seige against Judah and Jerusalem. The Anti Christ will follow the same pattern as the Syrian King Antiochus Epiphane in defiling the sanctuary. Once the Abomination of Desolation occurs, many Jews will flee to a place prepared by God to protect and nurture them for the remainder of the Tribulation and the glorious and triumphant return of Christ. I'll attribute the increase in earthquakes to end time prophecy. I don't buy into the fracking theory because I suspect most of those pushing the fracking theory are environmental whacko greenies that hate all things energy related that aren't wind or solar powered. God controls the weather, including earthquakes. Hydraulic Fracturing has produced several sinkholes, has contaminated ground water, caused swarms of small earthquakes, may even be linked to the spread of fish and fowl kills. This process has gone global, though the oil executives deem it safe and environmentally friendly, can you really trust their trillion dollar statements? The process involves large amounts of pressurized water coupled with chemicals to expose the shale under the earths surface. Obviously they have to set up near large sources of fresh water, interesting that the fish kills are in areas where this process is common. As far as the fowl kills go, red-winged blackbirds and sparrows roost in large gatherings near water sources, in fact their feet remain in the water while they sleep. If the chemical agents or toxic gases rising to the surface remain on their feet or wings, when they begin to fly it will enter their lungs and they will drop out the sky like dive bombers. I am not a green-nut however the evidence suggests their are several dangers associated with this process. Billy, a good place to research this starts with Arkansas, where this process has been increased in volume and so has the presence of death among fish and fowl. 27 And one week shall establish the covenant with MANY: and in the midst of the week my SACRIFICE and DRINK-OFFERINGS shall be taken away: and on the TEMPLE shall be the abomination of desolations; and at the end of time an end shall be put to the desolation. No difference in either; it still RELATES to the MANY i.e. the Majority which will have the power to have the say-so over ISRAEL. ISRAEL is the context and the subject matter and Grammar still concerns ISRAEL, not the ten kings – that may be what you BELIEVE but it has no foundation other than an ‘idea’ not supported by the literal text. Your ‘belief ‘ is an opinion made void of the given facts and therefore valueless without plain Scriptural support, and there is none. You are practising eisegesis, reading INTO the verse YOUR ‘belief’ to try and make it fit = square peg, round hole syndrome. This is SO boring! I am not pulling your rag for you again. E.I., you are entitled to your opinion regarding the interpretation, as I am also. Thankfully I am never bored seeking to understand the scriptures and what better source then the original Hebrew. Have a blessed day! Billy asked that same question "...Could they be put back into mortal bodies for this mission?" You left that unanswered, and then responded to me with "...I...agree to disagree regarding the possibility of even Moses and Elijah being the Two Witnesses...", yet you have not given anything that would rule out Elijah as one of the Two. And you mention Moses again after I had agreed with you at the very beginning that he had died once and was buried. I had further pointed out above that what was stated of Enoch in Hebrews is NO WHERE stated of Elijah, so he could very well still be a valid contender. As to Elijah showing up "...BEFORE [as EI capitalized it] the coming of the great and dreadful day of the LORD...", if there is an interim period between the Rapture and the start of the Trib, which I believe there is, I don't see any problem with Elijah showing up 6 months before in the same manner as John the Submerger. Rev. 11:3 only states: "...I will give power unto my two witnesses, and they shall prophesy a thousand two hundred and threescore days, clothed in sackcloth..." And we know that coincides with the "confirming the covenant" at the beginning of the Trib. as a starting point of their ministry, and not necessarily when they "show up". You say "...The Two Witnesses will have a starkly different task..."
You had me going for a while there DrNofog; I was just about to do a word search on 'submerger' when it dawned on E.I. wot yer was on about. John the Submerger, Immerser, Dunker... That was left over from a post a couple yrs ago on another channel where someone claimed that Baptists were the one true religion, stating that "...if it was good enough for John the Baptist, it was good enough for him..."